Often when sharing my opinions here, I choose to discuss things that I think Apple has done wrong—from the original implementation of Spotlight (which the company basically completely fixed in OS X 10.5) to the lingering annoyances in Leopard to the decision to eliminate matte displays, there are many things Apple does that just strike me as wrong or ill-conceived. Today, though, I’m sharing praise for an Apple product that has performed amazingly well for me. Recently, while reviewing our year-end records, I noticed that my original (Aqua-style) 23-inch LCD Cinema Display just turned six years old. This is my main monitor, and it’s in use every day. I was curious, though, just how many hours I’d been using it during those six years, so I did some rough back-of-the-envelope calculations. 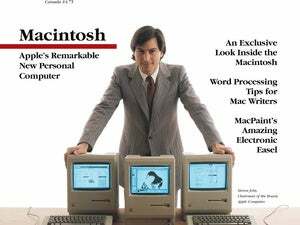 From its purchase in January 2003 through June 2005, I had a day job and used my machine primarily early in the morning and in the evenings to work on my avocation, the Mac OS X Hints site. Between weekdays and more use on the weekends, I probably averaged about six hours of use per day during those first 30 months. Then in June of 2005, my avocation became my job when Macworld acquired Mac OS X Hints and hired me on full-time. Since then, the monitor’s usage rate has increased dramatically. It’s now on anywhere from 10 to 14 hours a day during the week, though notably less than that on the weekends. Being conservative, I’ll assume a low average of 10 hours a day since June 2005 (44 months through January). Add it all up (using an average of 30.4 days per month) and that’s 18,848 hours of usage spread across six years. When I bought the monitor, it was quite expensive—at $2,000, it cost as much as an entire Mac, and to be honest, I wasn’t sure the expense was going to be worth it. I remember agonizing about possible dead pixels (as there weren’t any guidelines back then), and whether the display would last long enough to make the cost more reasonable. Yes, there were cheaper 1,920-by-1,200 monitors out at the time, but everything I read said that the Apple 23-inch LCD was one of the best you could get. As I wanted this monitor to last, I eventually chose to spend the extra money for the Apple monitor. So how has it held up over the years? There are a couple of tiny hairline cracks in the silvery surround that resides behind the plastic, but that’s about it for visible damage. The plastic case itself is fine, not showing any scratches at all. When I bought the monitor, it had one dead pixel (thankfully, in an out-of-the-way location and one that only shows on black backgrounds), and as of today, that’s still the only dead pixel. The monitor’s brightness seems to be right where it was when new, too—I leave the brightness slider in the middle of the range, and I find that makes the display more than bright enough for my eyes. So given the monitor is still going strong after nearly 20,000 hours of use (and three moves to new homes), I think it’s been well worth the cost. Looked at one way, the monitor has cost me about 11 cents per hour of use over six years, which seems a very reasonable price to pay. 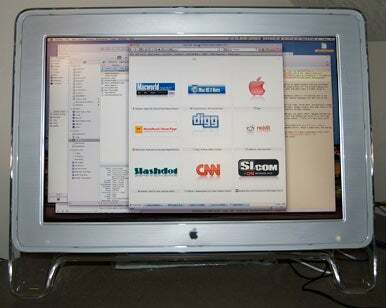 I’ve also had the monitor attached to a total of three different Macs during those years. At first, it was connected to a Digital Audio PowerMac G4, which I used until the spring of 2004, when it was replaced with an original PowerMac G5. Since the fall of 2006, it’s been connected to the first-generation quad-core Mac Pro (which did necessitate the purchase of an Apple DVI to ADC Adapter, to connect it to the DVI port on the Mac Pro’s video card). Will the monitor make it to another Mac? I have confidence that the screen and case will last. The bigger question is whether Apple will release another desktop machine that makes it worth replacing the Mac Pro—this machine is more than powerful enough for anything I typically want to do with it, so it’ll take something interesting to force the Mac Pro out of the house. If and when that happens, though, I expect my 23-inch LCD will be there, ready to work with the new machine when it arrives—even if its huge Aqua-esque bezel will look even more out-of-place by that time. So thanks, Apple, for building such an amazingly long-lasting monitor. I certainly wasn’t expecting it to be looking this good, nor working this well, six years and nearly 20,000 usage hours after I brought it home.